Something mysterious is going on at the reploid research island. The reploids have ceased functioning... their data strangely erased. Now the investigation team encounters 'irregular' reploids infected with a strange new DNA chip. This strange DNA chip, known as 'DNA Soul', replaces useful data with a devastating Sigma virus and places all reploids in imminent danger. Now, it's up to Mega Man X and his comrade, Zero, to get to the damaged island and find out who is behind the DNA Soul virus. --From the GBC Mega Man Xtreme 2 instruction manual. 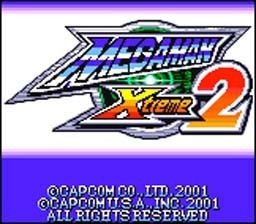 Play Mega Man Xtreme 2 Now! Mega Man X and Zero to solve this problem? This is about all they give you to go on, so the story line is a bit slack. Choose Mega Man X or Zero to save the world once again. destroy the boss to gain his power. Look for hidden upgrades and collect DNA Soul for more upgrades. The game starts with you picking Mega Man X or Zero. Once you have made up your mind, the game starts and you are stuck with that character until the fourth level. From then on you will be able to switch between the two. Mega Man X and Zero each have their own powers and abilities, but it seems that Mega Man gets a little more than Zero.